IT professionals at school districts face increasing challenges of managing aging network infra-structures and protecting their districts’ growing volumes of data. Limited budgets and resources are forcing IT managers to scrutinize their data protection systems and costs. Standard School District in Bakersfield, CA had outgrown their backup system and needed to find a replacement. 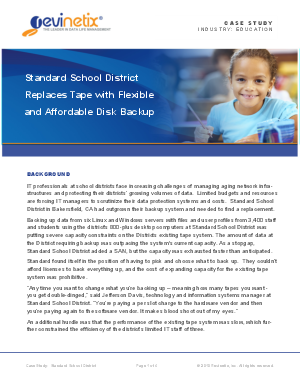 Backing up data from six Linux and Windows servers with files and user profiles from 3,400 staff and students using the district's 800-plus desktop computers at Standard School District was putting severe capacity constraints on the Districts existing tape backup system. The amount of data at the District requiring backup was outpacing the system's current capacity. As a stopgap, Standard School District added a SAN, but the capacity was exhausted faster than anticipated. Standard found itself in the position of having to pick and choose what to back up. They couldn’t afford licenses to back everything up, and the cost of expanding capacity for the existing tape system was prohibitive. An additional hurdle was that the performance of the existing tape system was slow, which further constrained the efficiency of the district’s limited IT staff of three. They were hoping to find an out-of-the-box, affordable, scalable solution that would meet their backup needs. They had three specific criteria the system would need to meet: Fast backup, Intuitive interface to simplify scheduling jobs, Flexible licensing to help manage costs. They found a solution in the complete hardware/software disk backup appliance offered by Revinetix.